Nagasaki, Japan, is familiar to Americans as the city on which the second atomic bomb was dropped, immediately killing over 37,000 people. Three and a half centuries before, 26 martyrs of Japan were crucified on a hill, now known as the Holy Mountain, overlooking Nagasaki. Among them were priests, brothers, and laymen, Franciscans, Jesuits, and members of the Secular Franciscan Order; there were catechists, doctors, simple artisans, and servants, old men and innocent children-all united in a common faith and love for Jesus and his Church. 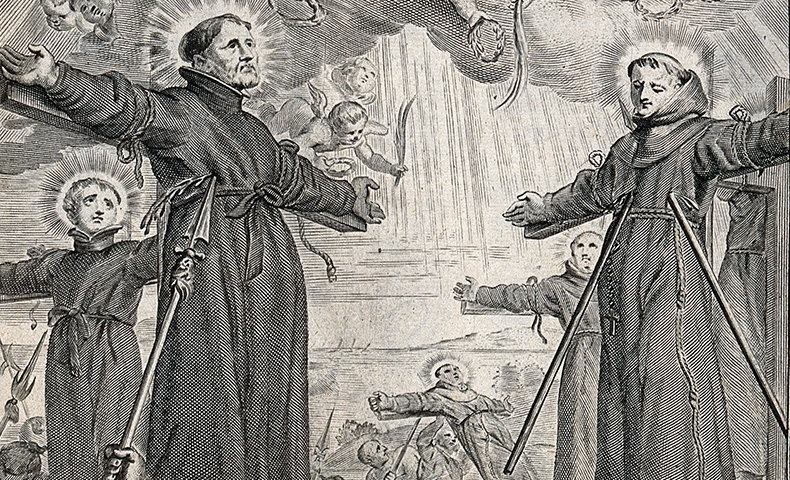 Brother Paul Miki, a Jesuit and a native of Japan, has become the best known among the martyrs of Japan. While hanging upon a cross, Paul Miki preached to the people gathered for the execution: "The sentence of judgment says these men came to Japan from the Philippines, but I did not come from any other country. I am a true Japanese. The only reason for my being killed is that I have taught the doctrine of Christ. I certainly did teach the doctrine of Christ. I thank God it is for this reason I die. I believe that I am telling only the truth before I die. I know you believe me and I want to say to you all once again: Ask Christ to help you to become happy. I obey Christ. After Christ's example I forgive my persecutors. I do not hate them. I ask God to have pity on all, and I hope my blood will fall on my fellow men as a fruitful rain." Today, a new era has come for the Church in Japan. Although the number of Catholics is not large, the Church is respected and has total religious freedom. The spread of Christianity in the Far East is slow and difficult. Faith such as that of the 26 martyrs is needed today as much as in 1597.